Ethereum price prediction: should I buy or will Ethereum crash? These days cryptocurrency is everywhere. You’re hearing about it on the news, at work, in the gym, and now even your Grandmother is asking you what it is. Price predictions, especially Ethereum price prediction is the trending topic right now. Two years ago, it was nowhere near as popular. It was only in 2017 that cryptocurrency really started to be noticed. In December 2017, the prices of cryptocurrencies got really, really high. The popularity of cryptocurrencies increased a lot. The cryptocurrencies that were talked about the most were Bitcoin and Ethereum. Bitcoin and Ethereum price predictions were in the news every single day. The future of Ethereum and Bitcoin were some of the biggest trends on Twitter, and they still are. In this guide, it is the Ethereum price prediction that I am covering. If you’re interested in Bitcoin predictions, read our Bitcoin Price Prediction guide. Even be able to make your own Ethereum price prediction! Before I get started, you need to know a little about Ethereum. If you think you already know enough about Ethereum, you can skip this part if you want. (Scroll down to “How an Ethereum Price Prediction Works”). Put simply, Ethereum is a platform that lets you build apps on the blockchain (like the blockchain that Bitcoin uses). Think of Ethereum as an operating system, like Windows or Mac OS! The smart contracts that it uses are similar to invoices. There is one big difference, though. An invoice is paid manually, so the person waiting to be paid must trust that the invoice will be paid. With a smart contract, you don’t have to trust anyone. It will always be paid. That’s a very, very basic explanation of Ethereum and its smart contracts. As you can see, it is very different to Bitcoin, which is just a digital currency. 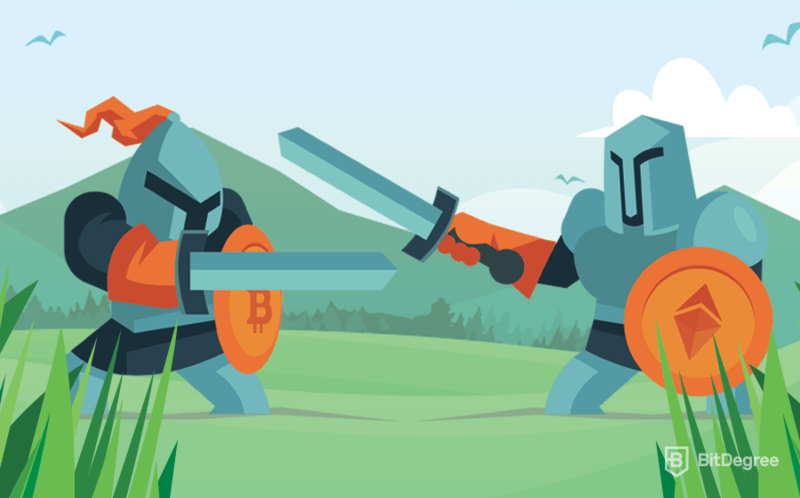 To learn more about Ethereum itself and its differences to Bitcoin, read our Ethereum vs Bitcoin guide. Now that you know a little about Ethereum, we can get started! The first step to learning how to make an Ethereum price prediction is to understand how and why the Ethereum price changes. Then, when we move on and look at some Ethereum price predictions, you’ll understand how each Ethereum price prediction works. If there is one rule you need to remember, it’s this: the price of Ethereum is whatever the market says it is. When I say, ‘the market’, I mean the people that are buying and selling Ether. Sometimes, this keeps happening until the price of 1 ETH goes up $200 or more in one day. This is all because of something called supply and demand. Oil is a perfect example of supply and demand. When there is too much supply (oil) and not enough demand (people wanting to buy oil), the price of the supply becomes cheaper. This is the same for Ether and other cryptocurrencies and it reflects in the Ethereum price predictions. One of the biggest reasons for a big change in supply and demand is the media. When there is good news about Ethereum or an expert gives a new Ethereum price prediction that says the Ether price is going to rise, the market listens! Lots of people start trying to buy Ether, and the sellers don’t want to sell it. So, what do the buyers do? They start offering a higher price to buy the Ether from the sellers. When there is bad news about Ethereum, what do you think happens? That’s right… lots of people start trying to sell their Ether. But, there aren’t enough buyers now to buy all the Ether that is being sold. So, what do the sellers do? They start offering a lower price to sell their Ether quickly to the first person that wants to buy Ether. Now that you know why the price of Ether changes, let’s take a look at some Ethereum predictions! With your new knowledge, you’ll have a much better understanding of how each expert has made their Ethereum price prediction. The questions that everyone wants the answers to! Will Ethereum rise? Will Ethereum crash? It’s always best to ask an expert, so here’s what Ethereum price predictions they have. Are you wondering what the Ethereum price might be at 2019? Let’s take a look at some Ethereum price predictions 2019. Mr. Schuster seems very confident about Ethereum and cryptocurrency in general. His Ethereum price prediction is that the price of Ether could be $100,000 by the end of 2019! That’s huge! He says that the total cryptocurrency market cap could get to $10 trillion at the end of the year, and that is why he thinks the Ether price could be more than $100,000. Note: Ethereum’s ‘market cap’ is the total value of all Ether together. So, the ‘total cryptocurrency market cap’ is the total value of all cryptocurrency coins together. That means Bitcoin, Ethereum, Litecoin, Ripple and all other cryptos together. An Ethereum forecast from one of the founders of Ethereum. Interesting! Just like Mr. Schuster, Steven is confident about Ethereum. His Ethereum forecast isn’t as huge as Mr. Schuster’s, but it is still very positive — Steven has predicted that the price of Ether could triple this year. Vitalik has said that 2019 will be the year of “ETH in action”. But, that’s all he’s said. He hasn’t predicted a certain Ethereum price. So, while Vitalik Buterin’s Ethereum forecast for 2019 doesn’t mention a price, it is still a very good thing for Ethereum. 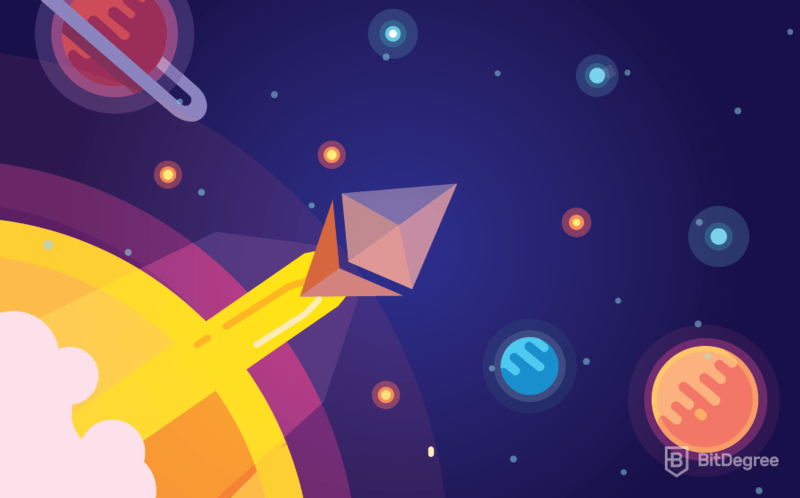 If 2019 is the year of ETH in action, we can only guess that the price is going to have a good year too! When it comes to discussing Ethereum crash, many Ethereum price predictions tend to look skeptical at it. Many think of Ethereum as the soil of cryptocurrency — so many things are built on it. For these reasons, it is hard to imagine that Ethereum will crash without then recovering afterwards. By this, we mean that if Ethereum did crash, we believe the price would go back up eventually. This doesn’t mean that it won’t happen. Just like every cryptocurrency, stock and commodity (gold, silver, oil etc. ), Ethereum could crash. Let’s look at the history of Ethereum and its price. This is a chart of Ethereum’s price over the last 12 months. The green line is the price of Ethereum in dollars. As you can see, the price has gone way down! It started at around $1416 and it is now on around $156 (01.04.19). It’s been a crazy year for Ethereum. The investors that bought Ethereum at the beginning of the year have experienced huge losses! Let’s talk money: if you had invested $1,000 into Ether when it was $1416 at the start of 2018, it would now be worth around $11. That’s underwhelming. Let’s take a look at a different chart. It’s quite similar, right? This is an Ethereum price chart from June 2017 to July 2017. June 12th until July 16th, to be exact. The price of Ether went from $397 all the way down to $170. Yeah… this wasn’t so great for investors. Well, it was fine for the investors that held onto their Ether and didn’t sell. But some investors panicked. They got scared because of the bad news (this is what I was talking about earlier!) that was being published about Ether. They sold their Ether and made a huge loss. As you can see, at this time, the Ethereum price prediction wasn’t very positive. If they bought at $397 and sold at $170, they would have made a 57.2% loss. This is why a lot of investors talk about ‘investing with emotions’. They say that you shouldn’t invest with your emotions (i.e. panic selling/buying), and instead just invest in what you believe. If you believe that Ethereum is changing the world and that the technology is going to be around for a long time, you shouldn’t listen to what the market is saying. Now, let’s take a look at one final Ether price chart. So, what happened here…? This was at February 2018. As you can see from the chart, the price of Ether crashed again. It didn’t get as low as it did in the crash of June 2017 ($170), but it did go down to $644 (02.06.18). Just 5 days before that (02.01.18), the price of Ether was $1,130. That’s a big crash! Ether lost almost half of its price in 5 days. It wasn’t just Ether that crashed, though — it was the whole cryptocurrency market. In fact, almost all cryptocurrencies lost half of their price. Some investors say that the crash happened because of bad news in China and South Korea; cryptocurrency is very popular in both of these countries. 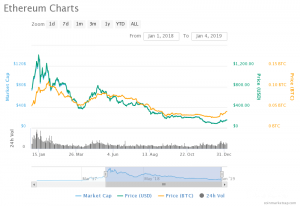 So, what did the Ether crash of early February 2018 mean for investors? Well, if you bought Ether at $1,130 on February 1st and sold at $644 on February 6th, you would have made a loss of 43%. So, it wasn’t as bad as the June 2017 crash (a loss of 57.2%), but it was still bad. A lot of people lost a lot of money. You now know how Ethereum price predictions are made, and what the experts are saying about the future of Ethereum. It’s always important to remember, though, that Ethereum predictions are just what they say they are — predictions. Nobody knows what the future is! There isn’t a single person in the world that knows what the price of Ether will be tomorrow, next week or next year. It’s impossible! All we can do is predict. By using the information in this guide and following the progress of Ethereum, you can make your own Ethereum price predictions too! If you have an Ethereum prediction of your own, be sure to let us know! You can compare and contrast your own predictions with ours, and see if there are any points that differ! Important note: You should always speak to a financial advisor before making any major investments and never invest more than you can afford to lose. Disclaimer: There are also other ways to predict the price of Ethereum, like chart analysis. This involves reading a lot of charts and graphs and using them to guess how the price will change. I don’t recommend using chart analysis to make your decision as to whether or not you want to buy Ethereum, which is why I didn’t talk much about it in this guide. They ar often difficult to understand – you would have to have a lot of knowledge on the topic to be able to analyse them and make the right predictions. *Note: this article is a personal opinion. Before making any investment decisions you should consult with a professional. great to read ,for someone like me who is learning how things work..
Well done. This is a good introduction.